No green thumb? No problem with this beautiful project. 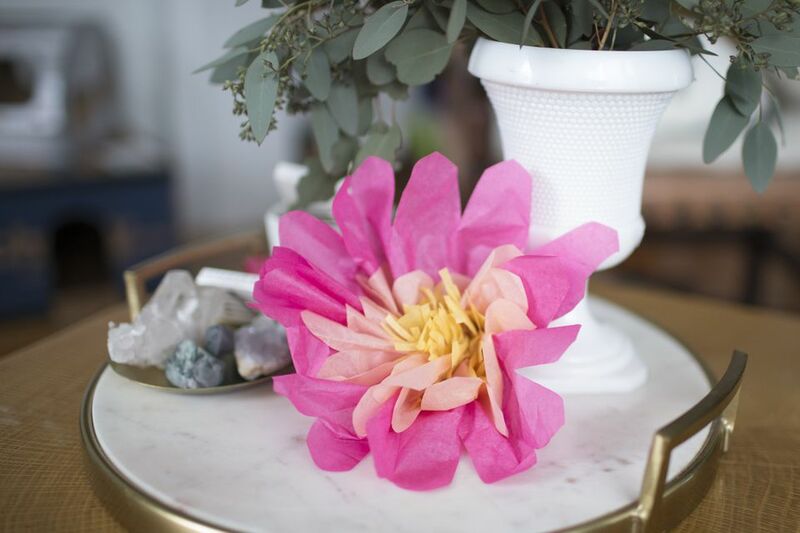 You could get away with making these tissue paper flowers at practically no cost. They make great centerpieces for parties, additions to tablescapes, or pretty photo backdrops. And that's it! Obviously patience is required as well, but we don't have to count that in our supply list. These flowers look a lot harder than they are. To get started you're going to want to choose three colored sheets of tissue paper. One will be the pollen-y center and the rest will be the outside petals. Start by folding each sheet in half long ways, then accordion fold each sheet until you're left with strips that are a little over an inch wide. Each tissue paper color will take on a different shape and size. Start with whatever color you'll use as the center of the flower and cut it down so that it's the shortest of the three colors. Then cut tiny strips into the top of the tissue paper only on one side. Next, move on to the petals. The technique will be similar, but you'll want the middle petals to be a little longer than the center and the outer petals should be a little longer than the middle. Cut them down to size, and on one end, round the edge using your scissors. Unfold all of the sheets of tissue paper and layer them one on top of the other. You want the center color to be on top. Accordion fold the pieces together so you end up with one thin section when you're done. The creases from the previous fold might not match up perfectly, but just do the best you can to match them. It won't matter when the flower is finished. Fold your tissue paper in half and secure using a piece of floral wire. Twist until it's tight and has almost tied off the center of the tissue paper. This will become the center of the flower. Twist the floral wire all the way down until the end. Cut any excess wire. You really want to make sure that the top loop is very tight, since it's what keeps all the layers together. From here you might be a little concerned that it's not looking very floral, but don't worry, we're not done yet! The most important part is being very gentle and patient as you open up the petals and arrange them so you're getting a floral shape. Spread the outer petals and middle petals, and round the tissue paper with your fingers. Separate the fringe on the center of the flowers to form the middle; this might be the hardest section because the fringe is very fragile. These flowers are a beautiful way to decorate a wreath and can even serve as DIY party decor. Happy crafting!